With budgets up and down the country being tightened and squeezed it was inevitable that the NHS would have to take on some of the burden. Unfortunately the NHS can’t simply pick the basics custard creams at the superstore instead of the more expensive ‘Taste the Difference’ Heart Surgery. It can however apply this concept to the food it buys in. But in a space where you are supposed to be given the best shot at recovery from serious illness is removing quality from meals that have a bad reputation already the right place to make the cuts? 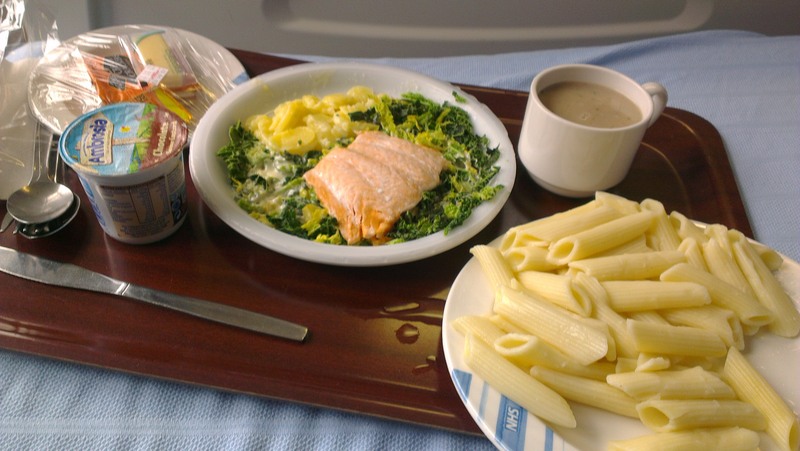 In 2011/12 the average money spent on patients meals per day rose by 2% to £8.58 but over the last 4 years since 2008/09 has risen by 27% when the average was just £6.71 for all the food and drink an in patient receives during a single day. This blog has been focused on Southampton General’s catering so far. This trust (Southampton University Hospital) increased its average spending on patient meals per fay from £7.69 in 08/09 to £11.11 11/12, both above the average for that year [foot] Full data sheets available from the Department of Health website [/foot] . However these figures are somewhat deceiving as they push all the different diets into one big mesh. Southampton has a nationally renowned Nutrition team and has for many years been able to give Nutritional support to complex cases that other hospitals are simply not able to offer. However the dieticians at the hospital are quite happy to tell patients how unhappy they are with the catering situation there. Medirest, which provide all the catering on site – including the retail franchises (Including Burger King, Costa Coffee and To Jours) – have served their Steamplicity menu to patients on a standard diet since December 2011. The menu is designed to offer choice, it has 28 different options available every day. They are picked by the patient every morning for that days Lunch and Dinner. However what most don’t realise is all Steamplicity meals are prepared off site and brought up to the ward to be cooked by a series of Microwaves in the ward ‘Kitchen’ [foot]Kitchen By name only, Microwaves, Hot water tap and a Dishwasher are all that fill the room[/foot]. One of the key benefits that this menu offers Hospitals is to ‘Save you Money’. This has clearly been an appetising prospect with 50 trusts now signed up to the service. Southampton was recently named as one of the 17 hospitals in the country that is dangerously understaffed. Having been in and out for the best part of three years, its fair to say this is true with a noticeable change in staff number in just the time I’ve been an inpatient. This makes it very difficult for both the staff and patients to question their food quality, it’s hardly high on the agenda when you have to wait so long for actual medical attention. Some people might argue that this is even more reason to squeeze the food budget, in order for it to deliver money for staff. Indeed this is exactly what Medirest’s Steamplicity promises. They say “significant annualized labour savings have been achieved, ranging up to £345,000 pa” at Trusts that use Steamplicity, but that money hasn’t been fed back into staff numbers, and as the blog as shown so far it hasn’t improved the specialized diets or delivered what it promises on the ‘A La Carte’ hospital food menu.